Simple is best with seafood and this recipe fits that perfectly. To keep the decadent, creamy texture of scallops, they need to be slightly undercooked so they don't become rubbery in texture. Make sure scallops are dry. Heat oil in a large nonstick skillet over medium-high heat until it is hot. Add scallops a few at a time, saute 2-1/2 minutes per side or until browned. Set aside, and keep warm. Repeat until all scallops are done. Wipe pan clean with a paper towel. Reduce heat to medium, melt butter in pan. Stir in garlic, cook about 1 minute. Return scallops to pan and toss to coat. 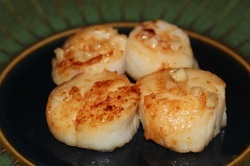 If you add too many scallops to the pan at once, the pan will lose heat and its ability to brown the scallops properly.